*These marinated fruit jars + video were created in partnership with non-gmo Opal apples. Watch for another recipe next month. Being on-the-go quite often, I’ve found myself stuck in a rut of eating snack bars or tiny bags of airplane peanuts found at the bottom of my purse when on the verge of hangry. Both of those have saved me, but they lack a boost of fresh, satisfying energy. 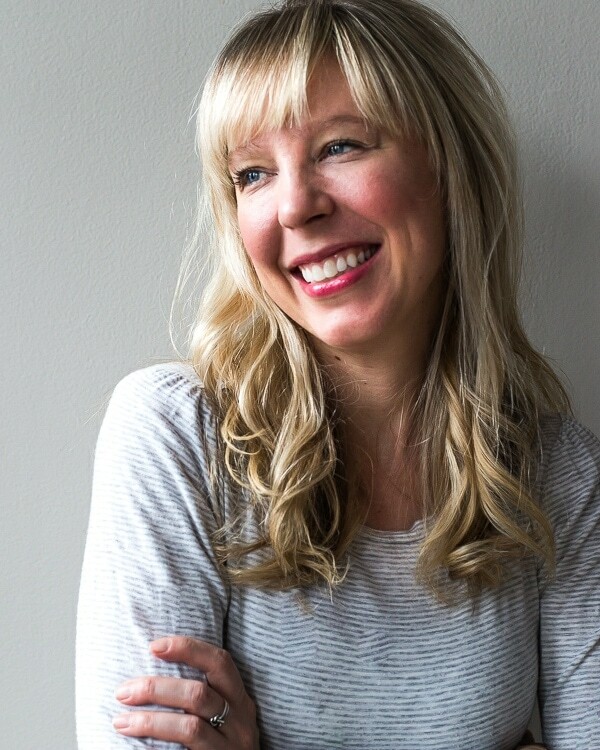 I batch cook grains, beans, eggs, and pasture-raised meats for quick and healthy meals throughout the week, but why wasn’t I doing that for snacks? 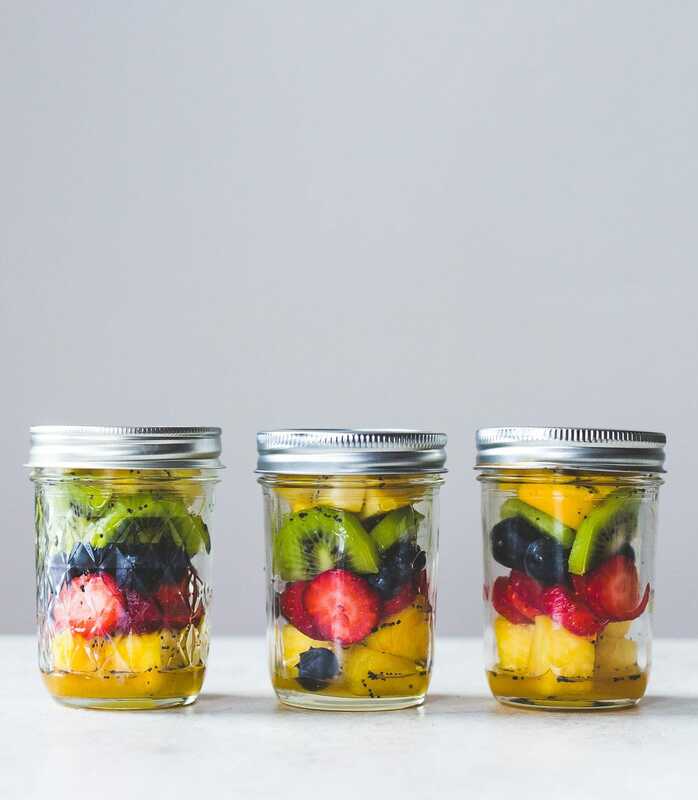 So I created these Honey Poppy Seed Marinated Fruit Jars as a make-ahead answer that you can store in the refrigerator for up to three days, and slide into your bag as you run out the door or put in in your little’s lunchbox. You can use any fruit you’d like, but I found a combination of pineapple, kiwi, blueberries, strawberries, and Opal apples. The best part? The fruit gets more flavorful, and juicer, the longer it sits. Yes, even the apples. THEY DON’T BROWN! And this isn’t because of something strange done to them while growing. The Opal variety, naturally resist oxidation, and are the first U.S. apple to be verified by the Non-GMO Project. Distinctively crunchy, floral, and and a sweet, tangy flavor.They’re in season right now (November-March), and you can find them at Trader Joe’s and Whole Foods nationwide. 8 ounce (half pint) mason jars are the perfect size because they keep the fruit stacked nicely on top of each other without much movement, and hold just the right amount of fruit. You’ll want to build the layers in the order suggested, and tip the jars after you seal to allow the marinade to touch all the fruit. Enjoy! These fruit jars will stay good, fully made, for 3-4 days in the refrigerator. 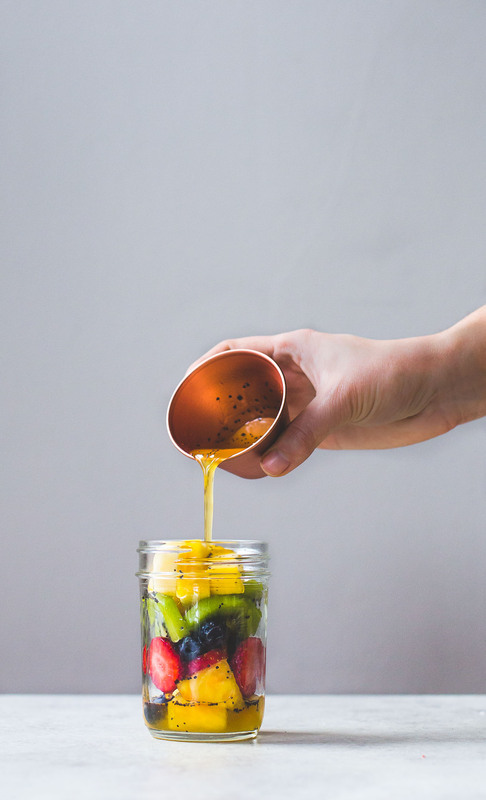 In half pint mason jars, create layers of fruit, starting with pineapple at the base, followed by the rest of the fruit in the order listed in the ingredients. Whisk honey, lemon juice, and poppyseeds, then pour 1½ to 2 tablespoons over each jar in a circular motion. Seal jars, then tip upside down so that marinade goes through all layers. Refrigerate for 3-4 days, remove when you want to eat, and tip jar once more upside down to distribute juices. This post contains Amazon affiliate links, which I may make a small commission if you decide to purchase. yes, those apples! and i love their flavor. not too sweet, which i find with other varieties. Love these and especially love that video!!! Such a genius idea to batch snacks!! airplane peanut packets floating at the bottom of my purse …. you’ve been replaced. Oh that video.. How fun! What a great idea to put them in mason jars. yes! no worries about them leaking, and easy to clean. I love this fruity jars! So delicious! I can’t wait to try this! Such a great idea! saves me on busy days! These look delicious! And healthy! I love this idea..not sure where I can find the apples..I use these small mason jar for overnight oatmeal ,which is good ..And I do the salad in mason jars also..Can’t wait to try your fruit in a jar..
hi Paula! you can get the opal apples at Whole Foods or Trader Joe’s around the country. enjoy! That video is everything! This looks amazing and like the perfect snack. I love these little jars of sunshine. Such a wonderful idea for on the go as well. I find myself getting in a ‘bring an orange for a snack’ rut at work and this would be a welcome change-up. My mom makes a very similar marinade for a fruit salad – I can’t wait to try your version! xo. These have been on my mind since you posted the recipe months ago. I finally made them this weekend and they have been such a treat for me and my two-year old son. I made them with apples, nectarines, raspberries, strawberries and blueberries. Thank you so much for the sharing the recipe!